Two by Four features nagauta voice singing the names of stars in Latin and Japanese along with gongs/taiko played mallet-style with two sticks in each hand. The graphic-notation score is modeled after a Japanese star map from the 16th century. One summer, I visited Ōn Ensemble in Mt. Shasta. Two of the members were raised near this sacred mountain. I wanted to experience the childhood homes of these Los Angeles-based musicians. One night, Maz, Kris, Shoj and his dad told stories under the stars. I fell asleep listening to their deep voices. In my slumber, I discovered that my role as a composer was to discover alternate sound possibilities for North American taiko music. Rather than structure rhythmic motifs, I thought about patterns of noise. 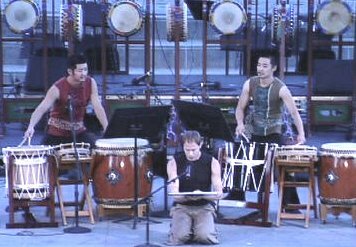 What if North American taiko music embraced the attention to sound textures of hogaku music? I realized that Two by Four embraced the ephemeral quality of circulating stars similar to the member of the Ōn Ensemble – transnational artists who travel between the United States and Japan. Two by Four hovers in a summer dream space, nagauta voice, gongs and taiko cross between the Latin and Japanese words for stars, between now and then, and between the listener and the night-mountain sky.